When you are in the market for new shades for your home, it is quite easy to start feeling overwhelmed at the sheer amount of options there are out there for you to choose from. While any and all of those options would likely be a wonderful addition to your home, there is one option out there that tends to stand out above the rest, and if you haven’t already considered it, now might be the time to do so. Woven wood shades can be an excellent addition to your home, no matter what kind of interior design you have, or what kind of design you are looking to create. Woven wood shades generally consist of natural woods, like bamboo or reeds that have been woven together, and come in a wide variety of different styles, designs, and wood types, so no matter what kind of windows you are looking to cover, you can rest assured that the perfect option is right there waiting to be found. If you are still on the fence about whether woven wood shades are the right investment for your home’s windows, we invite you to take a quick read through this short list our team of Grosse Pointe shutter specialists has put together that highlight just a few of the many reasons that woven wood shades could be the perfect option for your home. When you are looking for a window treatment option that is sure to bring a level of warmth and elegance to the interior of your home, there are few options that can accomplish this goal to the same degree that natural wood can. If natural wood blinds or shutters, aren’t exactly what you were aiming for, woven wood shades could be the perfect compromise. Woven wood shades can go with just about any kind of decor there is out there, no matter if you favor a more modern look in your home, or you have something a bit more traditional in mind. Woven wood shades are remarkably versatile, and can give you that flexible design element that you need to tie your look together. If you have larger windows in your home or doors that have large glass panes in them, you likely understand very well just how beautiful your home can be with all of that natural light. Unfortunately, with all of that natural light tends to come a great deal of glare and an uncomfortable amount of heat build up. In addition to the discomfort they can cause you, large windows can also present you with a number of privacy issues. Even with large windows, however, there are woven wood shades that are designed to cover them, and when you put them in place, they can help you a great deal with filtering out most of the harmful UV rays that come into your home and cause all of that excess heat and fade your furnishings. In addition, with new woven wood shades, you will no longer have to worry about privacy, as all you have to do is let them down. While we have gone over just what makes woven wood shades a wonderful addition to the interior of your home, you might be surprised to find out that they can be an excellent outdoor option as well. Woven wood shades can be that perfect touch to help you transform your home’s screened in porch area and make the space a more comfortable and enjoyable area for you and your family to share. Woven wood shades will still allow you to get that natural light to keep the space bright, but they can be let down to help you make the area a more comfortable space whenever the sun starts to make the area more uncomfortable. 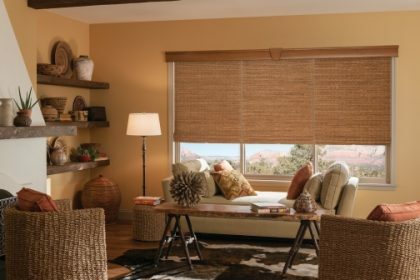 If you are looking for a woven wood shades company in the Grosse Pointe area, give us a call today at 586-771-8365 or fill out our online request form.